Our U16 boys had a convincing win over our rivals Lancashire at Wakefield Golf Club. It was played on a very hot day with temperatures touching 30C. The course was presented very well in deed and the boys found it a good test especially in view of the very dry conditions, having to think about the best way of managing their way round. 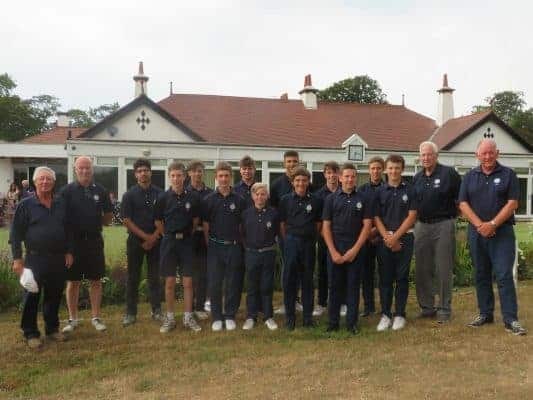 The team consists of four U16’s, four U15’s and four U14’s players with the foursomes going out in the morning followed by the singles in the afternoon. Five pairings in the foursomes took victory, Jack Ward & George Taylor, Josh Berry & Louie Walsh and Ben Brown & Luke Thornton finishing their matches on the 15th. Oliver Caton & Nathan Ali had a tough game against Alex James & Elliott Tickle taking their match to the 18th where they made a superb par to win 1up. Tom Pyman & Jacob Hodgson were 5Up at the turn, but a couple of errant tee shots let the Lancashire pair back into the game, but a halved hole on 17 allowed our pair to win 2&1. Sadly, the two Matt’s, Dolling & Wharldell got off to a bad start and were 4Down after the front nine but managed to claw their way back to 1 Down after 16. Sadly, a birdie on the 17th secured the only win for Lancashire. After a buffet lunch the boys set out in the singles matches with Jack Ward leading the way, 3Up after the front nine, never to look back winning 3&2. Nathan second out struggling with his putting lost on the 18th, there was never more than 1 hole in this game so a very close result! Turning to the remaining matches at half way there was very little in it, with the result looking like 6 games each! Our boys moved up a gear and five of them had convincing wins. Oliver Caton took his game to the last and managed to secure a win 1Up. Ben Brown had a fantastic match with the score never more than 1Up in it either way, both boys playing extremely well and Ben 1Up taking it to the last green for a grandstand finish. Unfortunately, after a wayward drive from Ben into the trees on the right, having to play out side ways, then onto the green for three. His opponent, Sam was way left on the first hole with his drive but played a superb second shot over the trees onto the green and with two putts from each player secured a halved game. Phil Woodcock commented, “Each and everyone of them played some fantastic golf during the day, especially in the very hot conditions where course management was very evident certainly in the afternoon, learning from some slight errors made in the morning foursomes and adapting. Although Lancashire are our main rivals the match was played in the true spirit of the game, new friendships were forged with both sides enjoying the day, win or lose”.